An absolutely beautifully toned imperial-sized albumen print, taken at one of William Henry Jackson’s favorite locales along the Denver & Rio Grande Railroad. Colorado (Rockwood Point). Circa 1886. Imperial-size albumen image; dimensions: 13-1/4 inches by 10 inches. Image mounted on original cream-colored board; dimensions: 20 inches by 16 inches. Superb tones and contrasts, with that highly sought after “eggplant coloration,” and thus fine detail. Both photograph and mount in near fine condition. 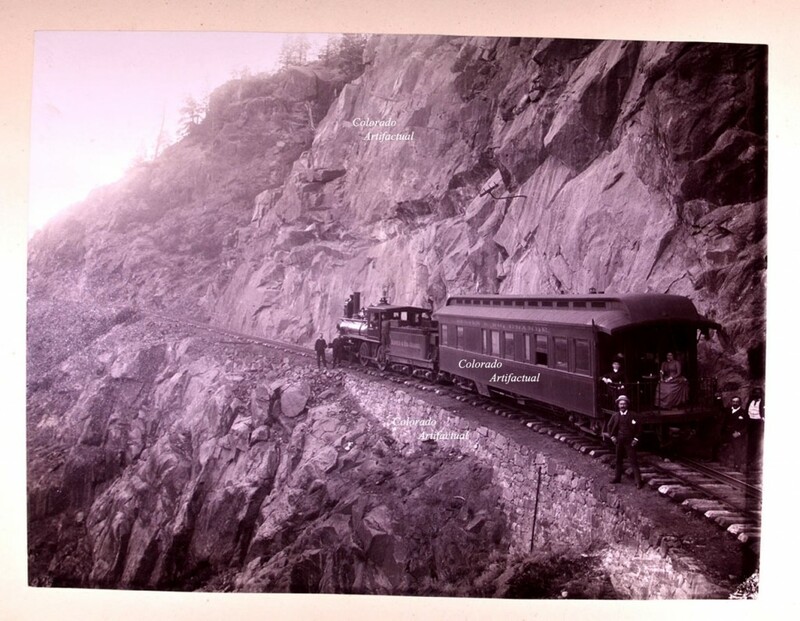 Engine #92 with coal- and passenger-cars; train traveling between Durango and Silverton, along the Silverton Branch of the Denver & Rio Grande Railroad. Train positioned at a point high above the Rio de las Animas, not far from Rockwood.